A distress signal has been picked up from the Vermis Space Station, in orbit above a planet. It seems their experiments have escaped, and now it’s up to you to clean up their mess! You’ll have to make your way to the station to investigate the situation first. Can you survive all of the giant monsters that await you in Rigid Force Alpha? You hop in your gunship and take off to investigate the situation. Rigid Force Alpha is inspired by a number of retro games, such as the SNES games Gradius III and U.N. Squadron (among many others). Like these old games, it has a continue system, where each continue gives you three lives. You only have three continues, and then it’s game over. The campaign is fairly short, but there are two extra game modes, Arcade and Boss Rush, as well as three difficulty levels to play on. Your AI sidekick gives you a briefing before each stage. Your gunship has a number of weapon systems, but only one can be equipped at a time. Like the previously mentioned retro games, which weapon system you have depends on what items you’ve collected during the mission. The picture below shows the spread shot. Like Gradius III, you can also get up to four floating drones that hover near your ship and provide additional gunfire. In the image below, they are all in the same spot, creating more concentrated fire. This can be great for stronger foes, like bosses. You can shift them a bit further back to spread them out more. They can also be shifted even farther back to create concentrated or spread out weapons fire behind you as well. The spread shot’s projectiles spread out as they fly away from you. 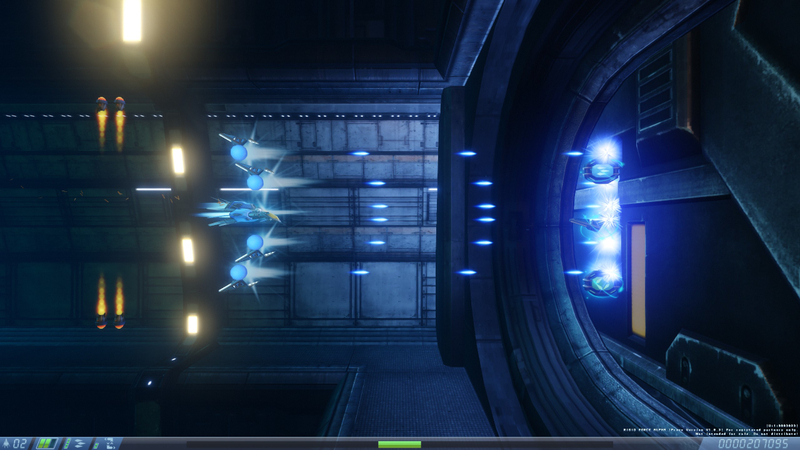 The bounce shot (shown below), is very dangerous for standard small enemies. Its projectiles bounce off of ceilings, walls, and obstacles. If you have all four drones, all this extra weapon fire and ricocheting can turn enclosed areas into a bullet hell for your enemies! This weapon is not always the most effective for bosses, though. There is also the laser weapon, whose blue projectiles fire straight ahead of or behind you. This is the best weapon for times when you need to move your drones together for concentrated fire, such as on a boss’ small weak point. 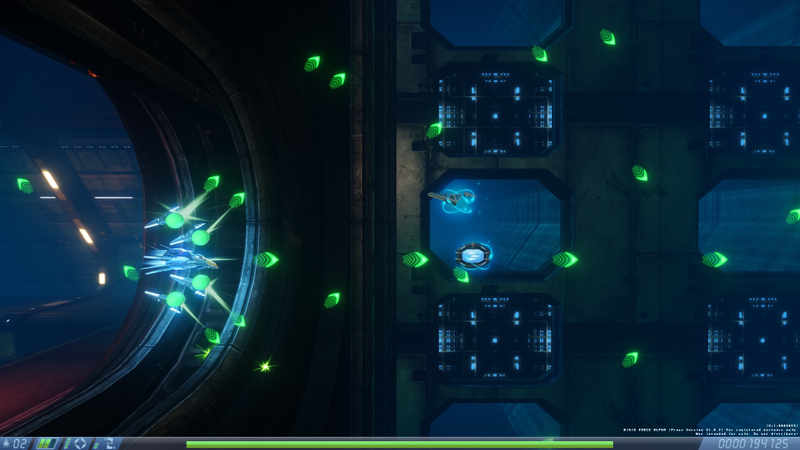 The bounce shot’s green projectiles bounce off of ceilings, floors, and other obstacles. 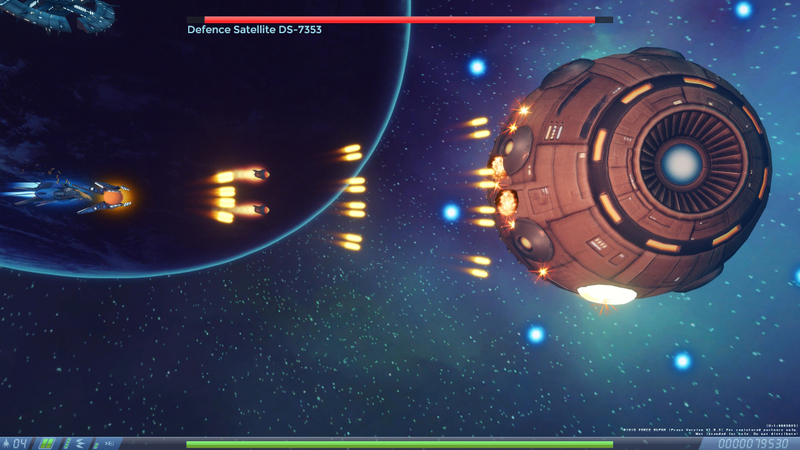 Your ship can also get missiles, which behave differently depending on which items you’ve collected recently. Missiles can fire up, down, or both, and you can increase the number that get fired with each volley. Their behavior can be changed by certain item pickups. They are most useful for enemies on the ground or ceiling. 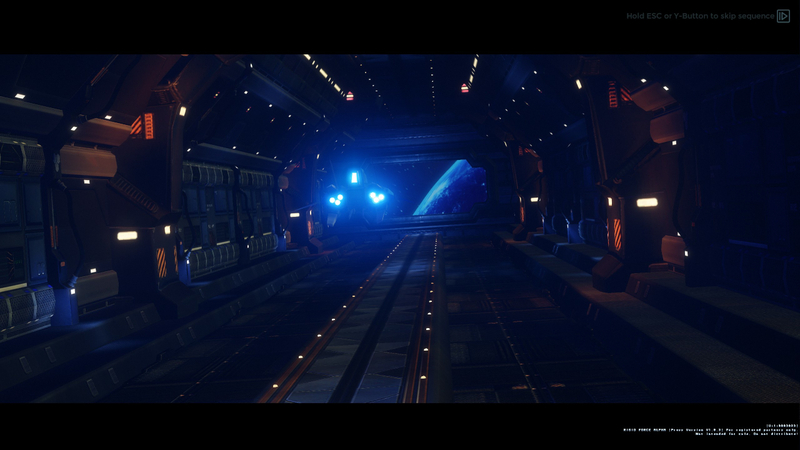 Along with the laser weapon, you can see four missiles in the image below, behind the ship. The lasers can create a dangerous barrage of forward or backward weapons fire. The gameplay of Rigid Force Alpha is pretty typical for a retro, horizontal shooter. 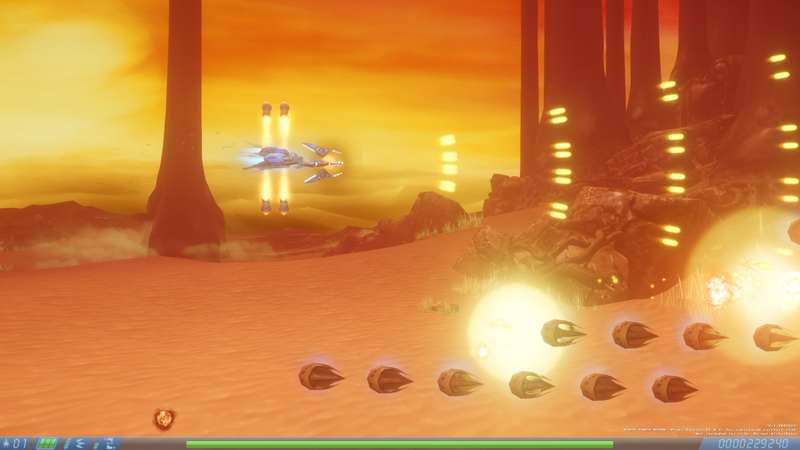 Fly around and shoot as much as you can for a higher score, while avoiding enemies and enemy weapon fire. In some cases, they can turn things into a bullet hell for you, but this doesn’t happen that much. Nonetheless, the game becomes quite difficult, even on the easiest difficulty level. 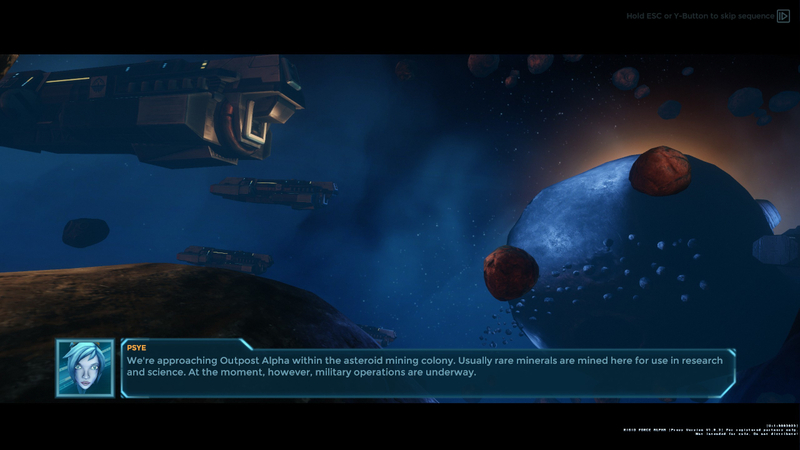 According to Steam’s global achievement stats for this game, just under one-third of players have beaten stage three, at which point you are halfway through the campaign. Only nine percent of players have beaten the entire campaign so far. To be fair, the difficulty is of course not the only reason players don’t finish, but I think it is a significant part of it in this case. Stage four is when the game really takes off the gloves and bares its claws and fangs at you. Your powered up weapons can devastate large squadrons of standard enemies very quickly. In this game, you’ll have an AI sidekick with you. She’ll give you a briefing before each stage, but this becomes annoying fairly quickly. These cut scenes can be skipped, but you have to hold a button for several seconds to do so, which feels a bit cumbersome. Due to the continue and game over system, you’ll be retrying the campaign a lot. This is where the game can start to become frustrating and/or tedious for some players, depending on skill level. 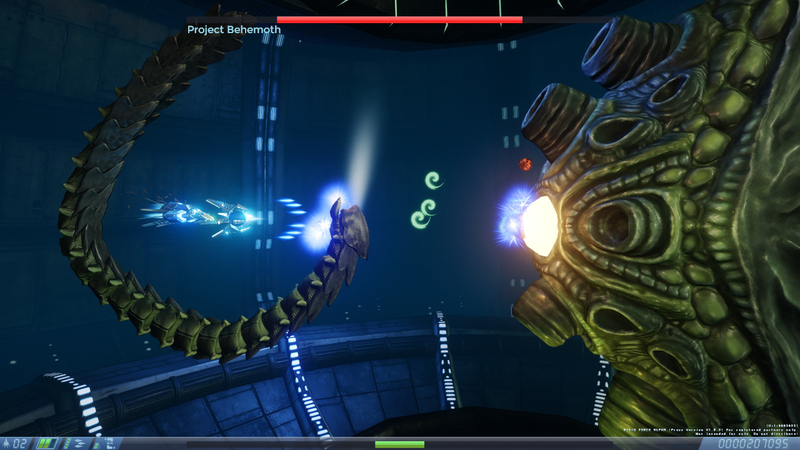 This boss’s death shows that explosions can be quite satisfying in Rigid Force Alpha! The graphics are very nice to look at. Unlike the retro inspirations for this game, Rigid Force Alpha has a much more modern, 3D aesthetic. Enemies and obstacles are all made of geometry, as is your own gunship. 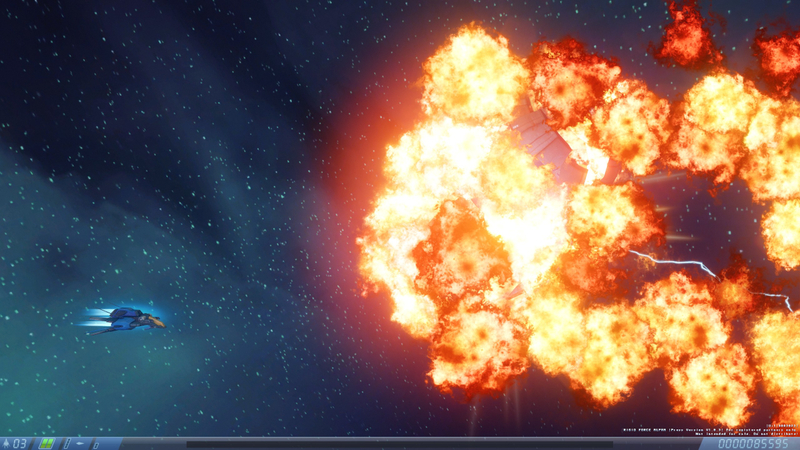 Explosions can be very satisfying, as you can see in the previous screenshot. 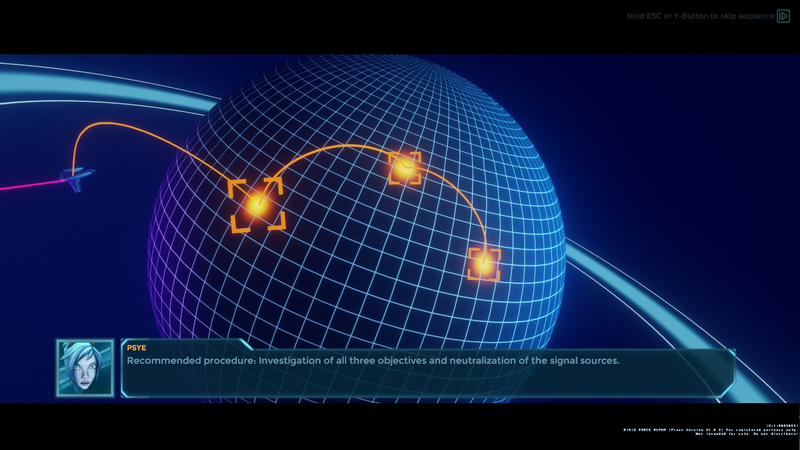 Several missions being marked on the planet’s surface, as the difficulty starts to ramp up fast. The sound effects are pretty good. The explosions have plenty of bass, which makes them much more satisfying. The music is pretty well done also. It has a retro flare to it that exudes the personalities of some of the previously mentioned retro games that Rigid Force Alpha was inspired by. A monstrous, early boss with a parasite helper. Rigid Force Alpha is a fun little game, but it can also be frustrating. It includes controller support, and I played using my Xbox One controller. If you’re up for it, you could spend a lot of time in this game, as it has some truly crazy challenges beyond the main campaign. There are 40 achievements across all three game modes, and some of them will probably have you tearing your hair out! For example, one involves beating the campaign on hard mode without taking any hits! You could spend 10 hours or longer just beating the game for the first time, and far more on everything else. I’ve spent upwards of 10 hours shooting down baddies so far. 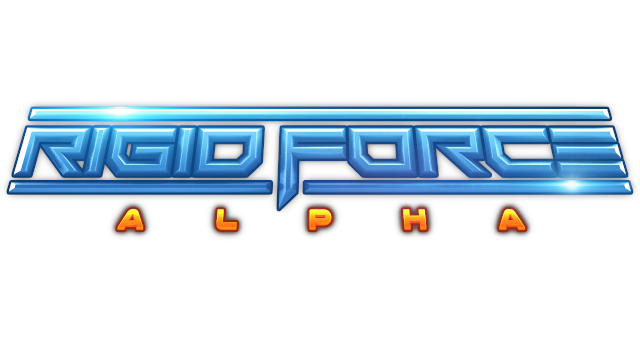 Rigid Force Alpha is available on Steam for $19.99, and you can also get the soundtrack. Are you an ace pilot good enough to survive this mission and stop the escaped creatures from spreading?